Labor Day Weekend is around the corner and it is the last HUZZAH for Summer Holiday Cookouts. The family gathers, kids water ski, your brother masterfully screws up the charcoal grill before the burgers and hotdogs go on… and you, very calmly, know that inside the kitchen freezer lies a magical dish of fresh summer flavors. Blackberry Cobbler Ice Cream awaits. I wish I could take the credit for this fantastic idea but it came down to me wondering what I was going to make for the pre Labor Day segment on "Rise and Shine" at dinner last weekend…out-loud.. and my friend Michael Z (Emily’s husband) whose eyes light up and yells out between bites of pizza, “COBBLER! PEACH COBBLER! BLACKBERRY COBBLER ICE CREAM!”. See? Inspiration and recipes can even come from food motivated firefighters. Thanks, Michael! Moore Firefighter and catalyst for this recipe, Michael.... and yours truly. Now, to be more specific, this Recipe O’ Mine is technically a frozen custard. We’ve covered this before with my Vanilla Bean Frozen Custard. I think we have… Yes, we have. But just to refresh, we’re adding eggs to the dairy and gently cooking and cooling before processing in our ice cream makers. Why Cook and Why Eggs? Well, the eggs need to cook first obviously but they also act as a thickening agent for our frozen custard. Smooth, creamy, and also a rich flavor that makes up this dish. More Than Pumpkin Pie Spice... so many uses and so much more! 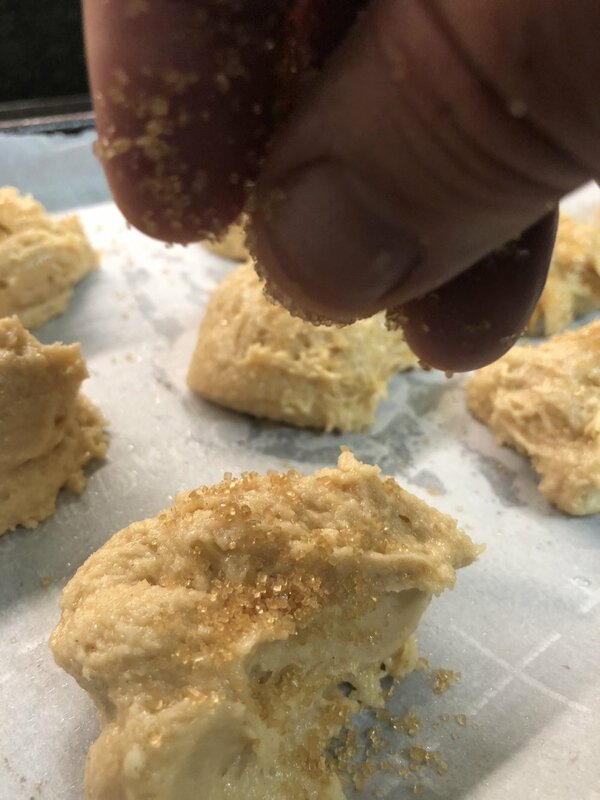 Add to the frozen custard spiced shortbread biscuits mimicking the crust of a cobbler. “Spice” courtesy of “More Than Pumpkin Pie Spice “ from the ITK line. Heavy on the cinnamon and ground cardamom these flavors play well in any fruit cobbler! Once the shortbreads are baked and cooled, FREEZE them. They’re easier to cut (and not crumble) and won't be a mass, soggy, crumble while you’re ice cream is setting up overnight in the freezer. After cooking your custard, strain to remove any over cooked bits. In a heavy bottom sauce pot add the sugar and salt. Next, pour in a mix the 2 cups of milk and one cup of the heavy cream. Gently heat to scalding, just when steam begins to rise. In a mixing bowl add the egg yolks and whisk. Using the scalded milk mixture and begin to “temper” the egg yolks. Add a ladle full of the milk to the egg yolks, whisking all the while, until all of the hot milk is combined with the egg yolks. Pour the mixture back into the pot and gently heat. Stir continuously to prevent scorching and curdling the mixture. When the custard has thickened and evenly coats the back of a spoon, remove from the heat. Using a fine mesh hand strainer over a clean nonmetal mixing bowl, for the custard through the strainer to remove any lumps. Place the bowl over a bowl of ice and whisk occasionally to cool. Cover the custard in plastic film and place into the refrigerator to chill at least 2 hours or overnight. When the custard is cold, pour into your ice cream maker and make according to the manufacturer's directions. 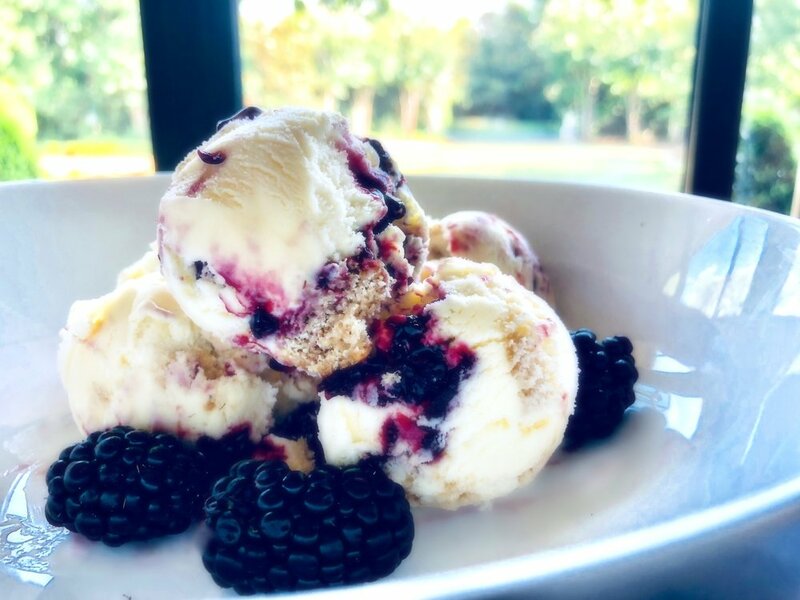 See the final steps of this recipe to complete the Blackberry Cobbler Frozen Custard, others enjoy this simple and delicious vanilla frozen custard. Sprinkling the tops of the spiced shortbread with crunchy turbinado sugar. Preheat your oven to 375-degrees, and prepare a baking sheet with parchment paper or a baking Sil-Pat. In a food processor add your flour, sugar, salt, baking powder, and More Than Pumpkin Pie Spice. Pulse a few times to mix all the dry ingredients together. Add the cold cubed butter and pulse until the mixture is crumbly. Place a heaping spoon full on the prepared baking sheet and sprinkle the tops with the crunchy/turbinado/raw sugar. Repeat until all the shortbread had been portioned and sprinkled. Place in the oven and bake for 15 minutes or until golden with crispy edges. Remove the cobbler shortbreads from the oven and cool completely. Once cooled, cover and place into the freezer. They’re easier to handle when completing the frozen custard. Cooking down the fresh blackberries with turbinado sugar. Place all of the ingredients in a large sauce pot. Begin heating gently. Once the mixture starts bubbling give the mixture a good stir and cover. Cover the pot and let the blackberry “jam’ cook for 15 minutes. Give the mixture an additional stir and continue cooking until the berries are soft and the liquid has slightly thickened. Remove from the heat. Pour the jam into a clean bowl and allow to cool. Place into the refrigerator and cool completely. A Delicious Mess.. ready to set-up in the freezer overnight. Remove the Cobbler Shortbreads fro the freezer and carefully cut into 2” squares. You may not need all of the shortbread, so what you don’t use save for another recipe or snack away! Scatter a good handle of the cut shortbreads into the bottom of your dish. Remove the Blackberry Sauce from the fridge. Spoon out half of the sauce over the shortbread. 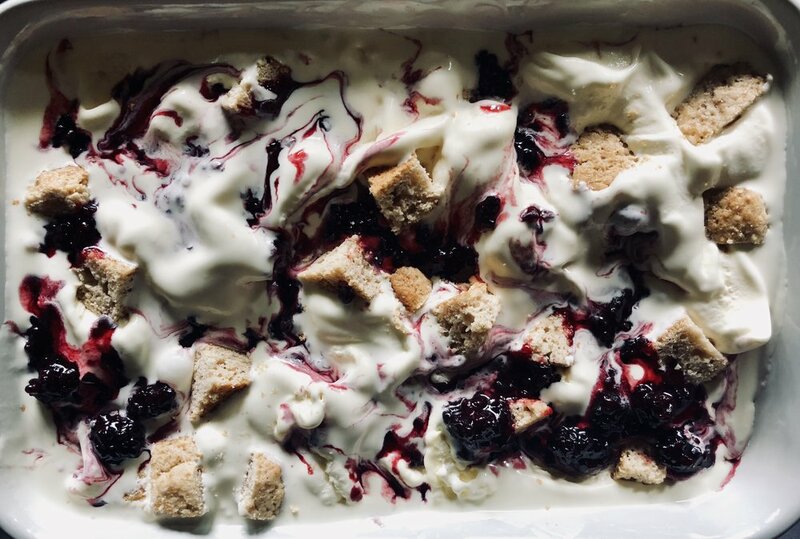 Spoon out your frozen custard into the dish over the shortbread and blackberry sauce, making sure it is evenly distributed. Drizzle the remaining blackberry sauce and blackberries on top along with extra cut cobbler shortbread. Swirl in, from top to bottom, the frozen custard so that you have a “ripple” or “marbled” effect to you frozen custard. Cover the dish and place the Blackberry Frozen Custard into the freezer to set up.. preferably overnight. Serve with extra fresh blackberries and shortbread. Enjoy!